Office Space - Kirkleatham, Tees Valley. 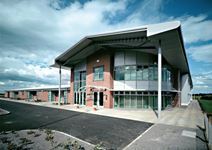 This business centre is located on a business park in an enterprise zone that offers business discount rates and is easily accessible from Redcar and Middlesbrough. The offices range from 149 to 1,789 sq. ft. while there is a gym and sauna on-site to relax away from work.